Loyalty has become a goal of many businesses. However, it is important that we define our goals correctly since they represent where and how we will direct our efforts. The problem that exists is with the definition of “loyalty” that is generally used. Loyalty is usually considered a situation in which customers come back to the same business repeatedly over time. If they routinely use the same business or buy the same product, they are said to be “loyal.” If that is the definition you are using – the goal you have set – then you have misdirected your efforts. Reach into your pocket or purse right now and pull out your keys. If your key ring is like many, you have a plastic card on it with a scan bar you can use at the local grocery store. You scan it and they give you a discount for coming in. It’s supposed to keep you coming back. In fact, these little plastic doohickies are called “loyalty cards” in the industry. Customers use them all the time, which is why, if you have one, you probably have it on your key ring keeping it handy. And it’s likely to be right next to a card for a competing grocery chain that you also use all the time. Now, if either grocery is tracking your visits (which, of course, they are), they know that you come back repeatedly. But are you truly loyal, or are you just taking advantage of a deal? This is not to suggest that there is anything wrong with “loyalty cards” to attract and hold customers initially. However, you should question whether this concept of “loyalty” based on bringing customers back repeatedly only because of special deals is what your ultimate goal should be. Say a young couple moves to a small college community. When they first get there, they tend to use certain stores and go to certain restaurants because these are the best that were readily available. Maybe they don’t particularly like the local discount store, but they keep going back because it’s better than any other options at the time. They frequent a certain Mexican restaurant, again, because it is the best available locally. From the definition of a long-term relationship involving repeat purchase, we would say they are “loyal.” But what will happen when new, larger, cleaner discount stores enter the market? What will this couple do when tastier, more interesting restaurants came to their city? Will they stay with the businesses with which we have established this so-called “loyalty?” Of course not. Would you? 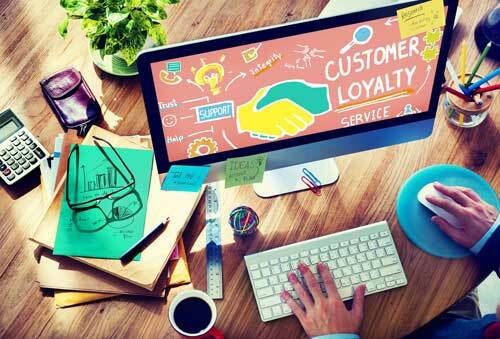 Thus it is that the term “loyalty” is frequently misused because most “loyal” customers aren’t really loyal, at least not the way we would like them to be. Customers who come back repeatedly because they are bribed with free things or special discounts or because they have no other real options, are actually only temporary visitors. They are renters – not owners. They are leasing – not buying. They are biding their time – not investing it in a way that will grow your business. Since the term “loyalty” is so often misused, it can be a big mistake to make it an indication of your success. What is missing from the common definition is an emotional tie to your business. Do customers actually get emotional about a business? Heck, yes! In the same way that Harley-Davidson owners speak passionately about their bikes, people can love, or at least like (i.e., have an emotional tie to) their retailer, business professional or supplier. These are the people who come back to the business over and over, not because they have to, but because they want to. They don’t leave when a competitor offers a slightly better deal. They talk to the business owner about their likes, dislikes or concerns because they want the business to be successful. And they tell others about the business becoming an unpaid sales force. These are not simply “loyal” customers. These are devoted customers. It is the creation of these devoted customers that should be your goal because they have the potential for truly growing your business. 1) Recognize the difference between devotion and loyalty as noted above so you can set your goal appropriately. 2) Develop an understanding of your customers’ needs as related to your business including emotional needs that you can satisfy. 3) Listen to your customers. Request frequent feedback, and respond accordingly. 4) Train your employees properly to interact with your customers. It is the interaction of you and your employees in a way that shows concern, respect and appreciation for your customers that will help instill an emotional tie and create devotion to your business. Can all customers be made to be devoted? No, unfortunately not. Some are only interested in price, or location or may crave variety. However, given the impact devoted customers can have on your bottom line through their spending and ability to bring in other customers, developing as many as possible should be well worth your efforts.